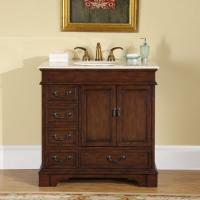 This beautiful single sink vanity base brings a lot of style and function to the bathroom. Designed to accommodate a single door cabinet with an interior shelf and two drawers, there is ample room for storage and organization to help keep the area neat. 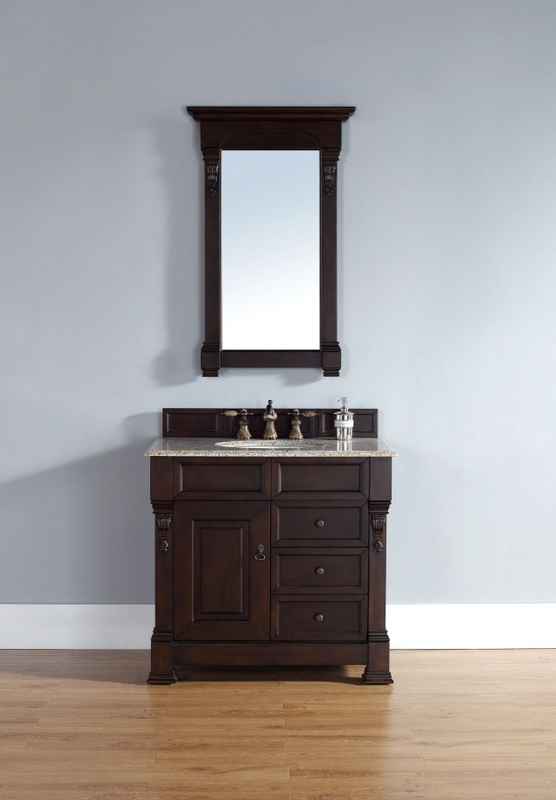 The burnished mahogany finish is a bold color and will make a great impact on the space. 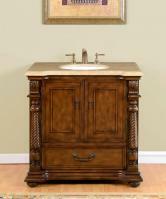 The transitional design has clean lines and features elegantly carved accents on the front. The antique brass hardware pulls add a nice touch as well. There are several color and material options available to select for the counter top. The dimensions of the piece, at three feet wide and almost 24 inches deep provide ample space for the counter top area. This piece has a great look that will go well with many styles of room dÈcor, so it will be a very welcome addition to the space, in addition to the great functions it brings to the home.